HONOLULU, HI -- (MARKET WIRE) -- April 3, 2007 -- Kamakura Corporation announced today that its monthly global index of troubled companies increased moderately in March to 6.2% of the global public company universe, compared to an index value of 5.8% in February. Even with the increase, however, the index of troubled companies is still below the 7.3% it had hit in December. The 16-year high in the index was 28%, reached in September 2001, the worst part of the last recession. The index's low point was 5.4% in March-May 2006. March 2007 global credit quality was better than 97.1% of the monthly periods since January 1990, down from 98.6% last month. The average value of the index has been 13.6% over the last 17 years. 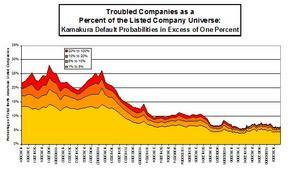 Kamakura defines a troubled company as a company whose default probability is in excess of 1%. The index covers almost 18,000 public companies in 29 countries using the fourth generation version of Kamakura's advanced credit models. "The troubles in the housing market contributed to the rise in the troubled company index this month," said Warren Sherman, Kamakura President and Chief Operating Officer. "Nonetheless, the increase in the index wasn't very great. 37% of the monthly changes in the index over the last 16 years have been greater than this month's increase. The biggest single month jump in the index was a 4.3% change in August 1998 in the run-up to the last recession. In March, the number of companies with default probabilities between 1% and 5% was 4.5% of the global public company universe, up 0.2% from February. Companies with default probabilities between 5 and 10% were up by 0.2% to 0.9% of the universe. The percentage of companies with default probabilities between 10% and 20% was unchanged in March at 0.5% of the universe. The number of global companies with default probabilities over 20% was also unchanged, totaling 0.3% of the universe at the end of March." Beginning in January 2006, Kamakura has moved to a global index covering 29 countries using the annualized one month default probability produced by the best performing credit model of the Kamakura Risk Information Services default and correlation service. The model used is the fourth generation Jarrow-Chava reduced form default probability, a formula that bases default predictions on a sophisticated combination of financial ratios, stock price history, and macro-economic factors. The countries currently covered by the index include Australia, Austria, Belgium, Brazil, Canada, Denmark, Finland, France, Germany, Hong Kong, India, Ireland, Israel, Italy, Japan, Luxemburg, Malaysia, the Netherlands, New Zealand, Norway, Singapore, South Africa, South Korea, Spain, Sweden, Switzerland, Taiwan, United Kingdom, and the United States. Kamakura is offering free trials of its KRIS default probability and default correlation service to qualified institutions. For more information on Kamakura's free trial offer please contact Kamakura at info@kamakuraco.com. More information can also be found on the Kamakura Corporation web site www.kamakuraco.com and in a chapter from "The Basel Handbook: A Guide for Financial Practitioners," second edition, (Michael Ong, Editor) by Kamakura's Donald R. van Deventer, Li Li, and Xiaoming Wang (available on www.amazon.com). Founded in 1990, Kamakura Corporation is a leading provider of risk management information, processing and software. Kamakura has been a provider of daily default probabilities and default correlations for listed companies since November 2002. Kamakura launched its business mortality model for unlisted companies in January 2004. Kamakura is also the first company in the world to develop and install a fully integrated enterprise risk management system that analyzes credit risk, market risk, asset and liability management, and transfer pricing software system. Kamakura has served more than 160 clients ranging in size from $3 billion in assets to $1.6 trillion in assets. Kamakura's risk management products are currently used in 23 countries, including the United States, Canada, Germany, the Netherlands, France, Switzerland, the United Kingdom, Eastern Europe, the Middle East, Africa, Australia, Japan, China, Korea and many other countries in Asia. Kamakura's research effort is led by Professor Robert Jarrow, who was named Financial Engineer of the Year in 1997 by the International Association of Financial Engineers. Professor Jarrow and Dr. van Deventer were both named to the 50 member RISK Hall of Fame in December 2002. Kamakura management has published more than 100 publications on credit risk, market risk, and asset and liability management. Kamakura has world-wide distribution alliances with IPS-Sendero (www.ips-sendero.com) and Unisys (www.unisys.com), making Kamakura products available in almost every major city around the globe.